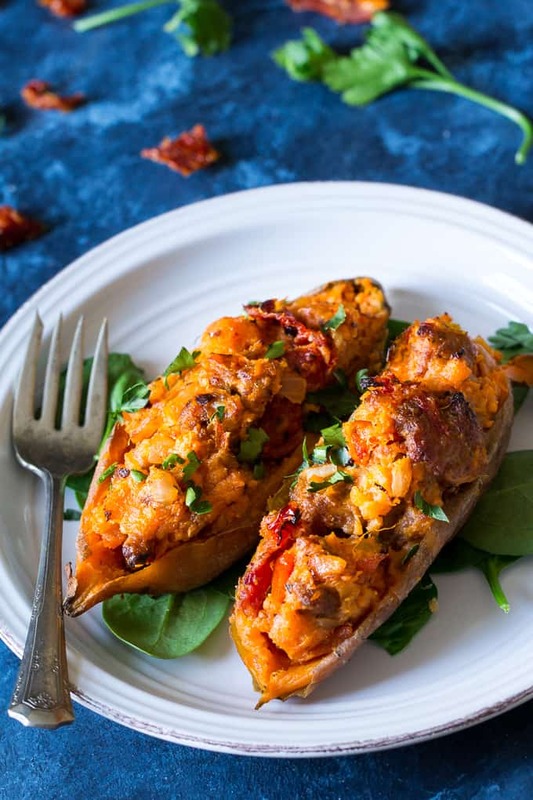 These are the ultimate Paleo and Whole30 Twice Baked Sweet Potatoes! 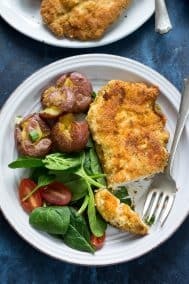 With an addicting filling that tastes just like sausage pizza, they’re a great weeknight dinner (do the first baking ahead of time), healthy, filling, and kid friendly. 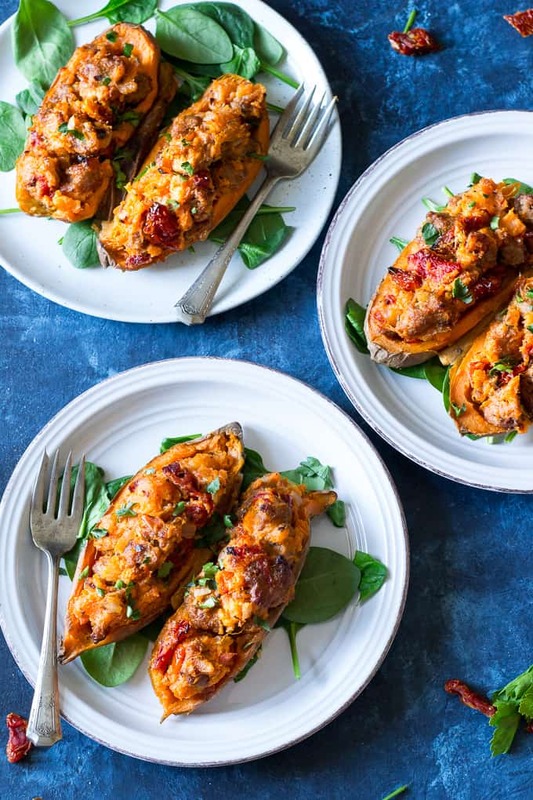 Seems like just yesterday I was stuffing sweet potatoes with chili (actually, it was last week) and now here are again stuffing our sweet potatoes – this time with sausage pizza filling. Does it get better? Yes, because then we put them BACK in the oven for the perfect crispy-final-touches. 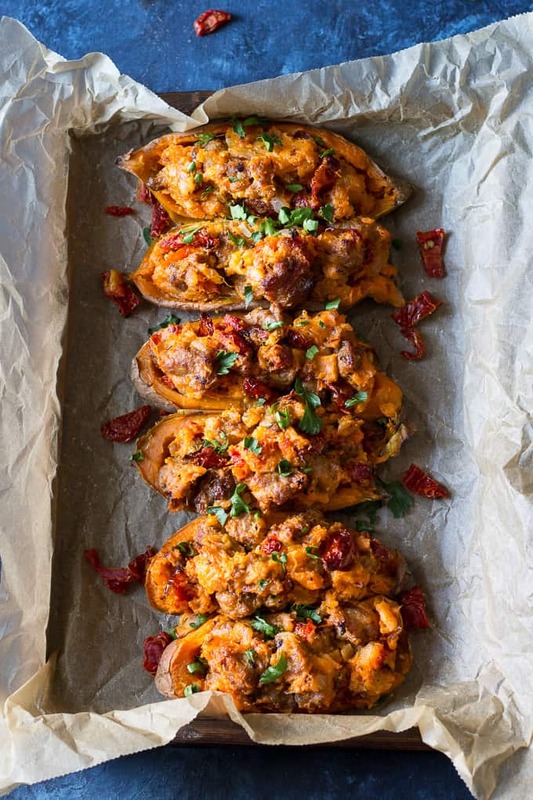 The result is twice baked sweet potatoes with a filling that might even taste better than actual sausage pizza. Don’t quote me – I’ll let you be the judge! We start out with baked sweet potatoes. A reader recently told me about salting the skin of the potatoes prior to baking, and, whoa – I’m never going back. 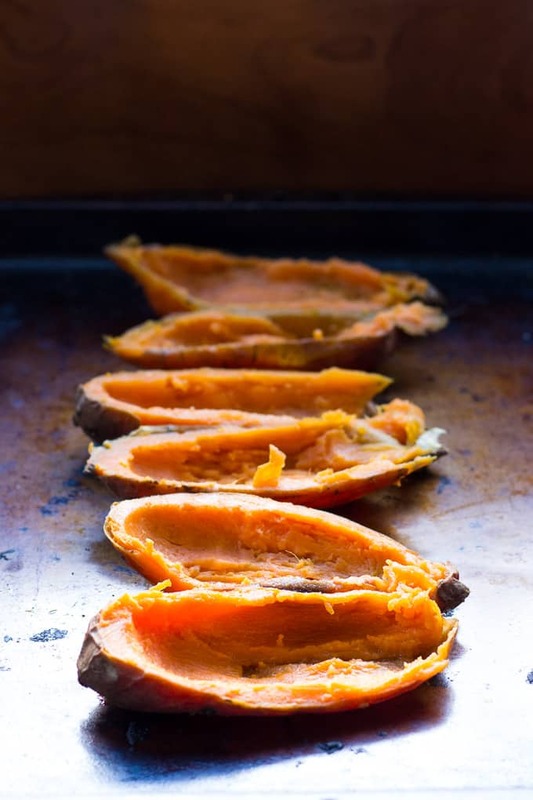 You can baked your sweet potatoes ahead of time to cut down the cook time by over an hour – in fact even if you HAVE all day, I highly recommend baking the sweet potatoes ahead of time. It just makes life feel easier, and I’m going to guess not many of us are ready to complain about that. Especially if you happen to be on day 10 of your Whole30 like I am. 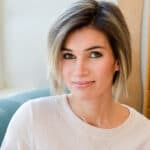 Did you know that people are most likely to jump ship on Whole30 on day 10 or 11? The sausage is telling you not to quit. But seriously, it DOES tend to get harder when you’re not quite midway through, and nothing seems to have changed except for the fact that you’re not letting yourself eat, um, a lot of things. Stay strong, send this recipe to someone you love and tell them to make it for you ASAP. Good things are on the way! Also, maybe get a fun tray and have that same person serve you these twice baked sweet potatoes on that tray while you’re cozy on the couch or in bed watching good-bad TV. Whole30 is starting to sound better now, don’t you think? Okay, for real though, even if you’re stuffing these in your face in a messy kitchen, while your kids are fighting, and you’re thinking about the 2 loads of laundry you didn’t fold, the emails that need checking, bills that need paying, and your husband texts you that he won’t be home until 9pm, THESE, my real-world friends, will still be delicious. Just saying. I’ve tried it myself. Sometimes I wonder if tired/stressed mom humor will ever get old to me. But anyway! 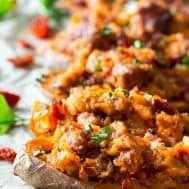 After you bake your sweet potatoes and you’re ready to go for the final product, you make a delicious – YES IT TASTES LIKE PIZZA – filling that includes sugar-free sausage (if you can’t find local, try U.S. Wellness Meats), chopped sun-dried tomatoes, onions and garlic, and Italian Seasoning. 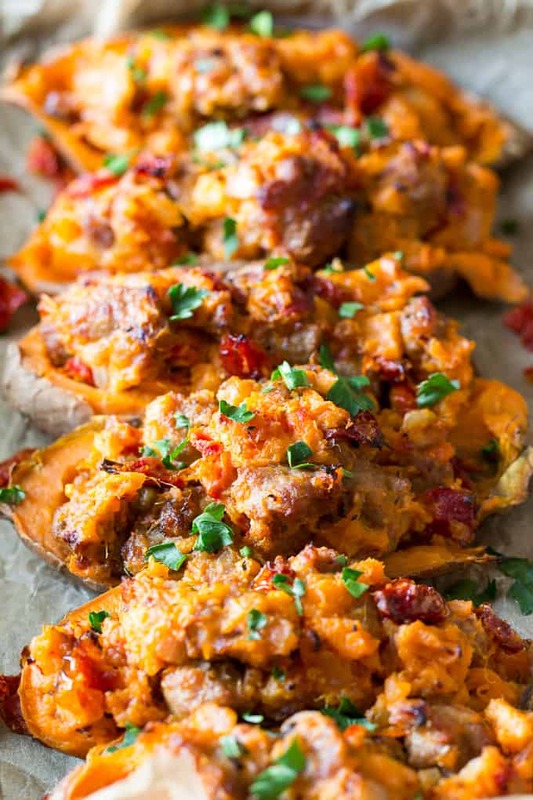 The ultimate Paleo twice baked sweet potatoes with an addicting sausage pizza filling! Do the first baking ahead of time and have these ready in 30 minutes. 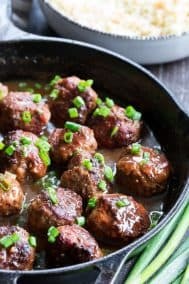 Whole30 compliant and kid friendly! 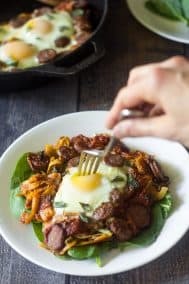 3/4 lb sweet Italian sausage or breakfast sausage - no sugar added for Whole30! Heat a large skillet over med heat and add 2 tsp cooking fat. 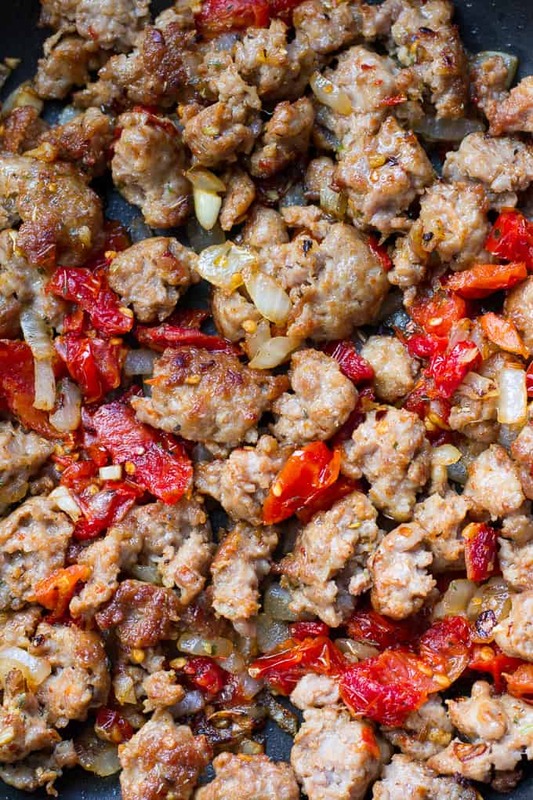 Crumble the sausage into the skillet and sprinkle with red pepper flakes, stir and cook until the sausage begins to brown. Add the onions to the skillet, stir and cook until translucent, then add the garlic, sundried tomatoes and Italian seasoning. 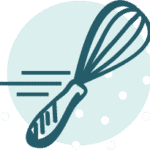 Continue to cook until the mixture is soft and toasty (about 2 minutes) then remove from heat. Cut each baked sweet potato in half, then scoop out inside (leaving a very thin layer), then mix with cooked sausage pizza mixture. Add salt to taste. 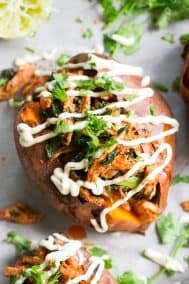 Scoop the sweet potato/sausage mixture back into baked potato skins (the more filling the better!) and bake in the preheated oven for 15-20 minutes until browned on top and skin starts to crisp. Serve hot and enjoy! *You can often find store-made sausage without sugar added locally, otherwise I love U.S. Wellness Meats' Pork Breakfast Sausage and Sweet Italian Sausage, no sugar added, for Whole30. **If baking them ahead of time, allow them to cool, then tightly wrap in foil and refrigerate until using. 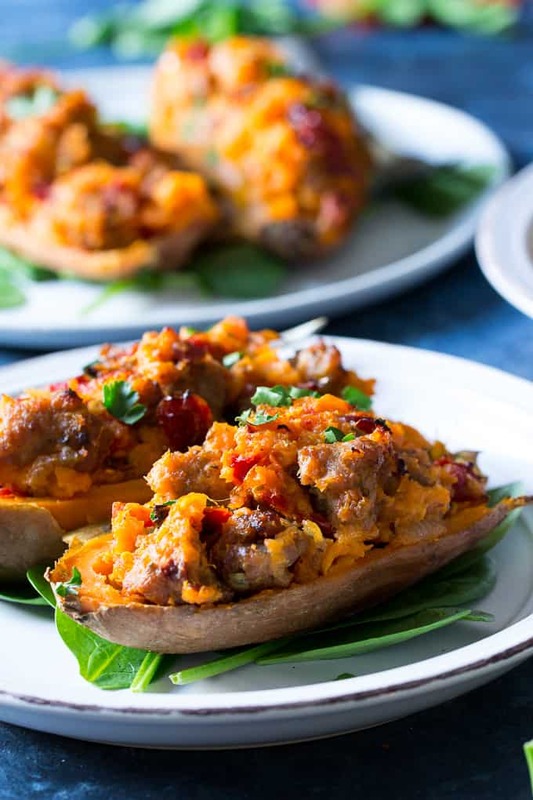 The ultimate #paleo and #whole30 twice baked sweet potatoes with sausage pizza filling! 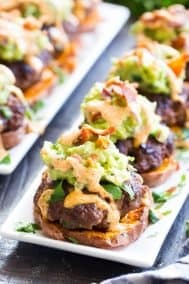 Want more Paleo and Whole30 sweet potato recipes? Try one of these! If you’re doing the Whole30, how is it going? What’s your current favorite sweet potato filling? I bet some dried cranberries would be masterful in here as well! 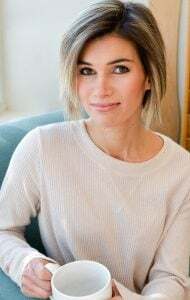 I think it’s definitely true that it would be tempting to jump ship on day 10 or 11, but the huge blessing is that there are increasingly more and more bloggers sharing a huge variety of Whole 30 compliant recipes that look and sound really good! Your blog would be a really good resource. These were OUTSTANDING! As in….I might eat them all week. 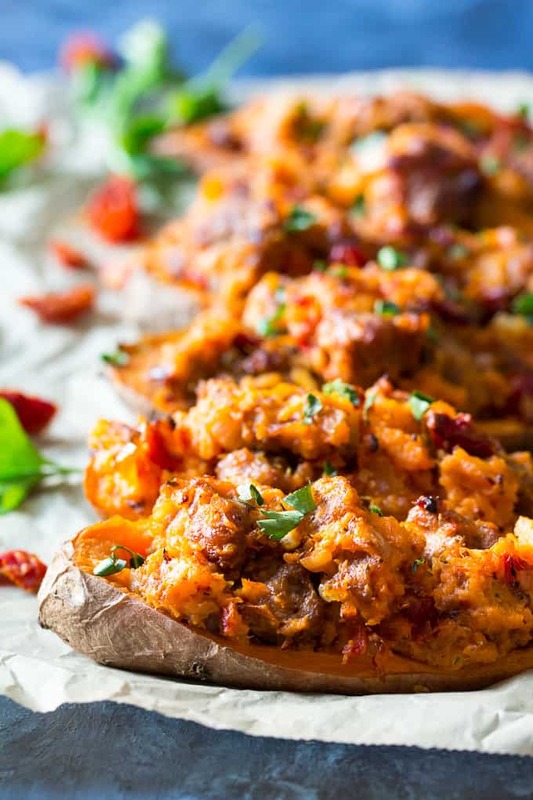 I’m not even a huge fan of sweet potatoes, but you knocked it out of the park with this recipe. Yes!! Thrilled you loved them as much as I did! 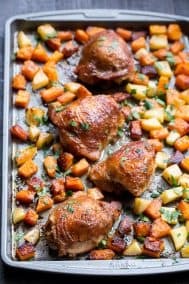 I love this, making it tonight. These were everything I wanted, perfect!!! 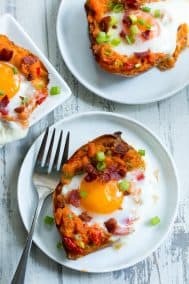 I will probably be using the filling ingredients in the future with cubed sweet potatoes as a base for scrambled egg bowls… yummy! This was sooooo amazinly awesome!!! 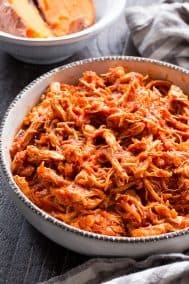 I took my leftovers to work and shared them with co-workers and they loved this recipe!!! This was the perfect Sunday night meal! How in the world did you think to combine pizza and sweet potato flavors?! It was simply delicious and my entire family – including picky teens – loved it and asked me to make it again soon. Really. Thank you!! !